Luton boss Mick Harford was left 'disappointed' that his side couldn't emerge with all three points at Plymouth Argyle this afternoon. The Hatters had by far the better of the chances during the 90 minutes, James Collins' denied superbly by former Town loanee Matt Macey, who also saved well from Elliot Lee. 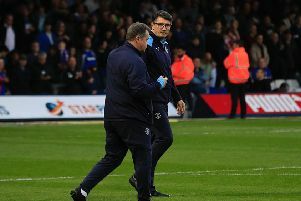 Harford felt that the visitors had done more than enough to triumph though, saying: "We’re very disappointed we haven’t come away with the three points. "Over the 90 minutes, we more or less dominated the game, in terms of possession, the way we played, with respect there was only one team who wanted to try and win the game, and that was us. "Once we settled down, especially in the second half, we created numerous, numerous chances and with a bit of luck, we would have won the game comfortably. "Their goalkeeper will obviously get man of the match, Matt Macey and well played to him, he pulled off some great saves. We know Matt very well, he’s got Plymouth a point basically in terms of the saves he’s made. “On the counter attack we looked very strong, Kaz (Kazenga LuaLua) when he gets into in one v one situations, is a real threat and when our midfield players get on the ball, we have good outlets with the full backs and the forward runs of the strikers. "So overall, I thought it was a very dominant performance and we are disappointed not to come away with the three points."